Adam Wait, DO is from El Dorado, Kansas and completed his undergraduate degree at Ottawa University, where he was an athlete and member of the football team. He attended Kansas City University of Medicine and Biosciences, graduating as a Doctor of Osteopathic Medicine in 2005. After Internship and Residency in Harrisburg, PA, he completed a Sports Medicine Fellowship at the University of South Florida in 2011. 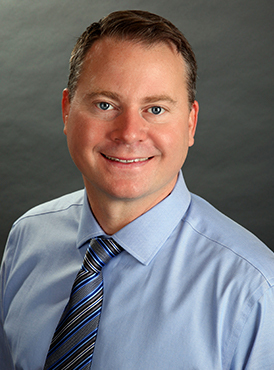 He does general orthopedics with a focus on Sports Medicine and hip arthroscopy, including labral repairs. Prior to joining Midwest Orthopaedics in 2015, he worked at Western Missouri Medical Center in Warrensburg, MO since 2011. Dr. Wait created the Western Missouri Sports Medicine program in 2012, working with athletic trainers to provide orthopedic and medical coverage for college and high school sporting events. He also provided sports physicals and screenings, and lectured to area coaches, athletic trainers, and the community. Dr. Wait sees patients at our main office in Shawnee Mission, and now also sees patients on alternating Wednesdays at our location on the campus of Prairie Star, in the Heartland Primary Care building. In his spare time, Dr. Wait enjoys spending time with his family and exercising when he gets a chance. He is married and has three children. Call Dr. Wait for appointments at either office, at (913) 362-8317 or request an appointment online.